How DOES an Older Brain Remodel Itself?! “Change is mostly limited to those situations in which the brain is in the mood for it.”On one level, there is a long history of studies in experimental psychology that show that we learn (our brain is plastic in an advancing direction) when the context is right (we’re attentive, it matters to us), and when we believe that we can succeed. For a historical perspective, see Boring EG, A History of Experimental Psychology (no longer in print, but your library probably has a copy, and you can probably buy a used volume because a lot were printed); for a general overview, see Gluck MA et al (2008) Learning and Memory: From Brain to Behavior. Worth, New York; or Dweck C (2008) Mindset: The New Psychology of Success. Ballantine, New York.Acetylcholine release plays a crucial role in enabling plastic change; its release temporarily increases the power of a wide range of otherwise-sub-rosa inputs being fed into any given cortical area, which enables the brain to “select” from that wider repertoire as it “specializes” its machinery to master the task at hand. At the same time, acetylcholine release also inhibits (selectively suppresses) inputs coming from the currently predominant input sources—which competitively favors NEW, alternative inputs that could potentially contribute to improving behavior. See Froemke RC, et al (2007) A synaptic memory trace for cortical receptive field plasticity. Nature 450:425-9; (2012) Long-term modification of cortical synapses improves sensory perception. Nat Neurosci 16:79. For an illustration of acetycholine modulation of plasticity in another wonderful animal model, see Keuroghlian AS, Knudsen EI (2007) Adaptive auditory plasticity in developing and adult animals. Prog Neurobiol 82:109. Many other studies could be cited.Acetylcholine is released when you are engaged in a behavior (“paying attention”), or when a brain is delivered a novel stimulus. With its release, “the filter (of possible, alternative inputs) is open” for up to several minutes. We and others have controlled the timing of the release of acetylcholine, pairing it with the delivery of specific stimuli in adult animals. That pairing results in the rapid, dramatic remodeling of the cortex, to exaggerate its representation of the paired input. By that strategy, in the adult brain, one can a) greatly elaborate the representation of a specific sound stimulus (Kilgard MP, Merzenich MM, 1998, Cortical map reorganization enabled by nucleus basalis activity. Science 279:1714; Weinberger NM, 1998, Tuning the brain by learning and by stimulation of the nucleus basalis. Trends Cogn Sci 2:271); b) refine the representations of temporal features of sound stimuli (Kilgard MP, Merzenich MM, 2001, Plasticity of temporal information processing in the primary auditory cortex. J Neurophysiol 86:326); c) ‘burn in’ the representation of any repeated sound sequence (Kilgard MP, Merzenich MM, 2002, Order-sensitive plasticity in adult primary auditory cortex. PNAS 99:3205); or d) can specialize the cortex to highly selectively represent the highly specific features of a complex stimulus (Mercado E, et al., 2001, Basal forebrain stimulation changes cortical sensitivities to complex sounds. Neuroreport 12:2283). One motivation in conducting these studies was to define how precisely that timed relationship had to be between activation of a brain system and the release of this modulatory neurotransmitter for enduring change to be achieved. It turned out that the time constant for the affects of acetylcholine are pretty long: once the brain is “turned on” to change by its release, plasticity is enabled in this selective way over a period of from tens of seconds up to 2-3 minutes. We believe that this long time constant accounts for your ability to drive plastic changes in a window of time after a period of close, intensive attention, even when that attention wanes for a minute or two (for example, see Wright BA et al, 2010, Enhancing perceptual learning by combining practice with periods of additional sensory stimulation. J Neurosci 30:12868. There is more to being “in the mood for change” than acetycholine. The release of other neurotransmitters is also in play. Moreover, acetylcholine-producing neurons project to dopaminergic (and likely oxytocin-releasing) neurons to modulate their activity and “color” the novel/attended context with just a little dose of positive pleasure! Novel stimuli also engage neurons that produce noradrenaline, and its release contributes to a broad, positive increase in baseline levels of arousal. One scientist who has contributed greatly to describing the complex interplay of different modulatory neurotransmitters is the physiological psychologist James McGaugh. See, for example, McGaugh JL (2000) Memory—a century of consolidation. Science 287:248; (2006) Make mild moments memorable: add a little arousal. Trends Cogn Sci 20:345; Roozendaal B, McGaugh JL (2011) Memory modulation. Behav Neurosci 125:797. For a different take in which the modulation of mood contributes to positive brain change from our own research group, see Van Vleet TM, Degutis JM (2012) Cross-training in hemispatial neglect: Auditory sustained attention training ameliorates visual attention deficits. Cortex (epub ahead of print). Hundreds of other studies documenting the impacts of mood on learning—or the mechanisms underlying those impacts—could be cited. On a third level, we (and others) have trained animals to respond to stimuli in one domain, while they ignored stimuli in another; then, delivering identical stimuli in both sets of animals, have flipped “what really matters” and “what does not matter”—showing that BIG changes occur in the things that are important to the animal, while NO changes occur in the domain that is irrelevant or is being ignored. For one of a number of such examples, see Recanzone GH et al (1993) Plasticity in the frequency representation of primary auditory cortex following discrimination training in adult owl monkeys. J Neurosci 13:87. The study by Polley et al (ibid.) cited in the notes after the last chapter is another particularly nice example. There are many earlier precedents to these physiological studies in the earlier training/learning literature. In another experimental variation, we created a task that could be performed a) with little effort on the animal’s part; or b) only with substantial effort and attention. NO change was seen in the former case, where the task could be achieved effortlessly; BIG changes were seen in the latter case, where the animal had to work hard, in a focused way, to succeed at it. See, for example, Xerri C, et al (1999) Representational plasticity in cortical area 3b paralleling tactual-motor skill acquisition in adult monkeys. Cereb Cortex 9:264. Again, very many animal and human parallels to these studies have been reported in the experimental psychology and learning neuroscience literature. In some cases (for example, in studies conducted by several naysayers about adult cortical plasticity), the fact that a behaviorally trivial task did not result in measurable change was incorrectly interpreted as evidence that the adult brain was not plastic. “The harder we try, the more we are motivated, the more alert we are, and the better (worse) the outcome, the bigger the brain change.”A very large body of psychological and physiological neuroscience has documented the relative power (and the impacts of variations in timing) of rewards or feedback on performance success (which results in internal ‘rewarding’ = dopamine release) and of other influences (like our baseline level of arousal) for the enabling of enduring brain or behavioral change. This literature is of great importance to us for the development of highly efficient brain training strategies. See Boring and Gluck et al (books cited above) as a starting point to get at a >century-long effort to understand the factors that control learning effectiveness. For an entry into the current literature about dopamine (reward-based) modulation, see, e.g., Schultz W (2010) Subjective neuronal coding of reward: temporal value discounting and risk. Eur J Neurosci 31:2124; (2007) Multiple dopamine functions at different time courses. Annu Rev Neurosci 30:259; for noradrenaline (arousal) modulation see Sara SJ, Bouret S (2012) Orienting and reorienting: the locus coeruleus mediates cognition through arousal. Neuron 76:130; Aston-Jones G, Cohen JD (2005) Adaptive gain and the role of the locus coeruleus-norepinephrine system in optimal performance. J Comp Neurol 493:99. “What actually changes in the brain are the strengths of the connections of neurons that are engaged together, moment by moment, in time.”The McGill psychologist Donald Hebb reasoned to the organizational power of synaptic plasticity mechanism by which synapses that fired together would be co-strengthened. “What fires together, wires together” Is the off-quoted restatement of his great principle. See Hebb DO (1949) The Organization of Behavior: A Neuropsychological Theory. J Wiley, New York. The basic mechanisms by which this plasticity principal is in play in the brain has been the subject of at least a hundred thousand scientific reports (and several thousand scientific reviews) published over the past 45 years. That work was greatly stimulated by the discovery of a synaptic modification process called “long term potentiation”, first documented physiologically by a young Norwegian scientist, Terje Lomo, in 1966. Those physiological changes showing that synaptic connections were strengthened by learning were supported by the parallel and subsequent descriptions of a series of physical and functional changes in synapses (they get bigger, have larger cell-to-cell contact areas, produce and spritz out more chemical transmitters at more neuron-to-neuron contact sites, generate stronger electrical responses, etc.) that account for their greater strengths. At about this same time, scientists began to use very elementary neural circuit models in primitive animals (one that was heavily exploited was the nervous system of a sea slug, Aplysia), to elucidate fundamental chemical and electrical properties of the ‘plastic’ (modifiable) synapse. For a history of these seminal early studies, see Kandel, ER (2007) The Search of Memory: The Emergence of a New Science of Mind. WW Norton, New York.This is an enormous and complicated subject. See the standard Neuroscience textbooks or Wikipedia for a start; or for a deeper dive, e.g., Buonomano DV, Merzenich MM (1998) Cortical plasticity: from synapses to maps. Ann Rev Neurosci; Martin SJ, Grimwood PD, Morris RG (2000) Synaptic plasticity and memory: an evaluation of the hypothesis [that memory is a product of plasticity] Ann Rev Neurosci 23:649; Bi G, Poo M (2001) Synaptic modification by correlated activity: Hebb’s postulate revisited. Ann Rev Neurosci 24:139; Malenka RC, Bear MF (2004) LTP and LTD: an embarrassment of riches. Neuron 44:5; Citri A, Malenka RC (2008) Synaptic plasticity: multiple forms, functions, and mechanisms. Neuropsychopharmacology 33:13; Feldman DE (2009) Synaptic mechanisms for plasticity in neocortex. Ann Rev neurosci 32:33; and Cooper LN, Bear MF (2012) The BCM theory of synapse modification at 30: Interaction of theory with experiment. Nat Rev Neurosci 13:798. “Learning-driven changes in connections increase brain-cell cooperation, which is crucial for increasing performance reliability.”Many experimental and theoretical neuroscientists beginning with investigators inspired by Donald Hebb have appreciated the importance of—and have variously documented—growing, plasticity-generated cooperativity in “learning” cortical networks. We have recorded simultaneously from neighboring neurons in many hundreds of experiments, recording an increase in the coupling between them and the consequent increase in the reliability of the “message” from progressively-more-cooperative assemblies of neurons in cortical columns for representing behaviorally important signals in EVERY behavioral training/neuroplasticity model (i.e., and reported these changes in more than 30 published training studies). See Merzenich MM and DeCharms RC (1996) Neural representations, experience and change. In: The Mind-Brain Continuum, MIT Press, Boston; or Merzenich MM, Jenkins WM (1993) Cortical representations of learned behaviors. In: Memory Concepts, Elsevier, Amsterdam; de Villers-Sidani E, Merzenich M (2011) Lifelong plasticity in the rat auditory cortex: basic mechanisms and role of sensory experience. Prog Brain Res 191:119. We have also increased local cooperativity and recruited many “neuronal team members” into functionally-defined cortical columns (what I later call “cortical microprocessors” in the book’s narrative) by artificially, simultaneously exciting sensory inputs from a specific peripheral source, or by simultaneously exciting (via microstimulation) a small population of cortical neurons. These studies (and there are many parallels in the wider literature) dramatically illustrate this key facet of cortical plasticity. See, for example, Recanzone G, et al (1990) Receptive field changes induced by peripheral nerve stimulation in S1 of adult cats. J Neurophysiol 63;1213; Nudo RJ, et al (1990) Repetitive microstimulation alters the cortical representation of movements in adult rats. Somato Motor Res 7:463; Recanzone GH, et al (1992) Expansion of the cortical representation of a specific skin field in primary somatosensory cortex by intracortical microstimulation. Cerebral Cortex 2:181; Dinse HR et al (1993) Alterations in correlated activity parallel ICMS-induced representational plasticity. 5:173. One scientist whose theoretical instincts have been generally compatible with my own in this and most other respects has been the Nobel Laureate Gerald Edelman, who fully appreciated the power of cooperativity in cortical networks. See, for example, Neural Darwinism: The Theory of Neuronal Group Selection (1978).One of the most beautiful description of ‘neural ensemble’-based representation comes from the studies of Apostolos Georgopoulos and colleagues, who showed that after training, reaching trajectories come to be represented by highly cooperative populations of neurons. See Georgeopolos AP et al (1988) Primate motor cortex and free arm movements to visual targets in three-dimensional space. II. Coding of the direction of movement by a neuronal population. J Neurosci 8:2928; and in extension, showing that the same coding applies when the monkey just THINKS about moving, Georgopoulos AP et al (1989) Mental rotation of the neuronal population vector. Science 243:234. This long series of (I think) under-appreciated studies is one of the most original and important achievements of modern integrative neuroscience.It should be noted that cooperativity indexes the feed-forward power of the output of any given cortical zone, for three reasons. First, it assures the forward delivery of coordinated inputs, which by that coordination enable Hebbian change because more things ‘are firing together’ at those output-projection destinations. Hebbian plasticity operates with a very short time constant; coordination is key for inputs falling within that narrow window—and only in that case can plastic changes be induced at those output-projection destinations. Second, the stronger the coordination, the more salient the neuronal assembly’s “message”. Third, the greater the coordination, the weaker the degrading interference of network “noise” (response “chatter”). [I’ll later discuss how myelination is the second great factor underlying learning-induced system reliability in normal and impaired human brains. Well-myelinated brain machinery conserves coherence, and ships around those well-coordinated “messages” with limited information loss; poorly myelinated brain machinery degrades cell assembly-based coherence, and obviously results in what can be catastrophic information loss. Importantly, I have long believed—and will later argue that science supports the hypothesis—that the strengthening of local coordination INDUCES myelin formation. Which is another way of saying that these contributors to your brain power are inseparably linked with one another in their plasticity and control. From a broader, philosophical perspective, the one great trick of our brain is to organize its activities in the domains of place and time to create reliable, coherent, salient models of our “worlds.” It’s not just about who responds. Without plasticity-driven refinements in coordination, the representations of things in our world just can’t rise above the chaos. “Initial changes are just temporary. If the brain judges the experience to be inherently fascinating or novel, or if the behavioral outcome is a good (or bad) one, they THEN become permanent.”This is an elemental aspect of plasticity processes that is well understood mechanistically. In its early history, scientists often called this “intermediate (as compared with long-term) plasticity”. See reviews under Rule 2, above. The great mid-Century psychologist Karl Lashley appreciated that our brains followed this strategy because he understood that we could mentally revisit something that had occurred over any recent epoch of time, THEN record it via learning or remembering, for posterity. See Lashley K (1950) In search of the engram. Soc Exptl Biol 4:454. “The brain is changed by internal “mental” rehearsal in the same ways and involving precisely the same processes that control changes achieved through interactions with the external world.”See the study of Georgopoulos and colleagues cited above; Ungerleider LG, et al (2002) Imaging brain plasticity during motor skill learning. Neurobiol Learn Mem 78:553; Wolfensteller U (2009) Juggling with the brain—thought and action in the human motor system. Prog Brain Res 174:289; or see one of my favorite books about neuroscience and the ‘mind’: Cortex and Mind: Unifying Cognition (2003) by the great UCLA professor Joaquin Fuster. Fuster points out that the frontal cortical machinery is equivalently engaged when you come to a conclusion in thought, or as you control/evoke a voluntary movement, or in any other action when you decide, and act on it, through physically expressed action, or ‘in your mind’. Of course.It is astonishing, in light of the evidence, that any serious scholar still views “mind”-work as somehow distinguishable from other brain-work. “Memory guides and controls most learning.”See, for example, Hochstein S, Ahissar M (2002) View from the top: hierarchies and reverse hierarchies in the visual system, Neuron 36:791; Ahissar M et al (2009) Reverse hierarchies and sensory learning Phil Trans R Soc Lond 364:285; Suga N (2012)Tuning shifts of the auditory system by corticocortical and corticofugal projections and conditioning. Neurosci Biobehav Rev 3:969; Rizzolatti G, Craighero L (2004) The mirror-neuron system. Ann Rev Neurosci 27:169.The dynamic relationships between representations across different brain system levels are continuously in play i.e., are modeled as ‘recurrent networks’. For an introduction to this deeper level of understanding of how ‘models at the top’ influence the representations of inputs that feed them, and vice versa, see, for example, Jeff Hawkins’ very readable treatment On Intelligence; or to follow other threads, as a starting point, read the attempts of Gerald Edelman, Jay McClellan, or Terry Sejnowski (among many others), who are among an imaginative groups of theorists who have tried their hardest to put recurrent networks into real brains. “Every moment of learning provides a moment of opportunity for the brain to stabilize—and reduce the disruptive power of—potentially interfering backgrounds or “noises.””The bimodal nature of plasticity has been described in great detail in innumerable studies. Studies from the laboratory of Mu-Ming Poo (UC Berkeley) have done a particularly nice job of reconstructing the time course of synaptic-strengthening and synaptic-weakening as a function of the temporal separation between the arrival of inputs in their studied neurons. The appreciation that synapses can strengthen OR weaken has been very extensively studied from another perspective (the “BCM Theory”; see reviews referenced above as a starting point) in the laboratory of Mark Bear and colleagues at MIT, where baseline levels of activity (chatter) are shown to influence the ‘set point’ been positive or negative plasticity. They show that it’s increasingly difficult to operate on the positive side of the fence as the power of background chatter grows in the brain. Many other scientists have contributed to this complex neuroscience area.One of my favorite “real whole-brain animal” models of these effects were conducted by the Weizmann Institute scientist Ehud Ahissar, who demonstrated early on that synapses strengthen for stimuli that an animal (in his case, a macaque monkey) was making judgments about, and weaken for everything else that was simultaneously recorded that was NOT correlated with getting the answer right. [Ahissar E et al (1992) Dependence of cortical plasticity on correlated activity of single neurons and on behavioral context. Science 257:1412.] Again, there is a very long history (hundreds) of related behavioral studies conducted using in vivo and in vitro (“brain slice”) experimental approaches.We have also studied a second aspect of learning by controlling the release of dopamine in the normal Pavlovian-learning paradigm, or by delivering the dopamine in a “reverse conditioning” order (i.e., with the reward delivered before rather than after the stimulus). As you may remember, in that case, an animal can NOT learn to associate the stimulus with the reward. Moreover, once one repeatedly delivers a reward before a given stimulus, it becomes difficult if not impossible to condition the animal to that same stimulus via normal Pavlovian conditioning, i.e., with the stimulus now in its “proper” place, i.e., followed by the reward. The neurological basis of this effect was made clear by our study: When the reward preceded the stimulus, cortical changes related to it “ERASED” its representation in the cortex i.e., responses evoked by it were dramatically plastically weakened (not strengthened). See Bao et al (2003) Suppression of cortical representation through backward conditioning. PNAS 100:1405; as contrasted with Bao S, et al (2001) Cortical remodeling induced by activity of ventral tegmental dopamine neurons. Nature 412:79. This backward conditioning effect is consistent with the argument that immediately following the reward signal, there is a narrow epoch of long-term depression (LTD). In that post-reward epoch, any inputs arriving in the network are plastically weakened. It should be noted that the effects of normal Pavlovian and reverse conditioning are HIGHLY selective. In the former case, plasticity results in the very selective strengthening of the representation of the conditioned stimulus (and increases the coordination in the responses of neurons who represent it) AND weakens the representation of other stimuli representing other stimuli in the spectral neighborhood. EXACTLY THE OPPOSITE is recorded with reverse conditioning, i.e, the stimulus applied in backward conditioning loses ground that is occupied by the representation of other stimuli in the spectral neighborhood. “Brain plasticity is a two-way street. 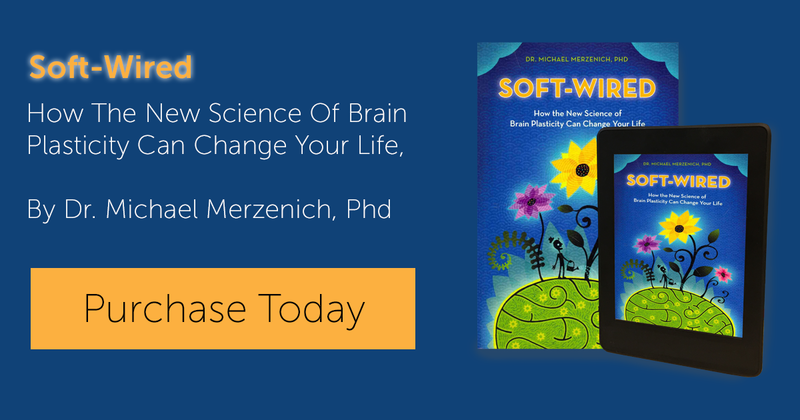 It is just as easy to generate negative changes as it is to produce positive ones.”We have conducted many studies in which we have refined cortical responses—or, through training, just as easily, degraded them. In general, changes follow the Hebb rule. See, for example, Bao S, et al. (2003) Progressive degradation and subsequent refinement of acoustic representations in the auditory cortex. J Neurosci 23:10765; Merzenich MM, Jenkins WM (1993) Reorganization of cortical representations of the hand following alterations of skin inputs induced by nerve injury, skin island transfers, and experience. J Hand Ther 6:89; Wang X et al (1995) Remodeling of hand representation in adult cortex determined by timing of tactile stimulation. Nature 378:71; Byl NN, et al (1996) A primate genesis model of focal dystonia and repetitive strain injury. Neurology 47:508. Degradation in the brain and behavior of human dystonia patients parallels that recorded in our monkey models. See, e.g., McKenzie A, et al., Sensory representation of the digits and clinical performance in patients with focal dystonia. Am J Phys Med Rehabil 82:737.For studies showing how brain plasticity-guided rehabilitation can “correct” the large-scale distortions that account for the neurological distortions that result in dystonias, start with Byl NN (2012) Diagnosis and management of focal hand dystonia in a rheumatology practice. Curr Opin Rheumatol 24:222; for a broader perspective, see Flor H, Diers H (2009) Sensorimotor training and cortical reorganization. Neurohabilitation 25:19.